All Boxers acquired by Boxer Rebound undergo a comprehensive medical examination and are spayed/neutered as soon as medically advisable. They are micro-chipped, brought up-to-date on vaccinations and tested for heartworms. Any medical issues identified are documented and addressed. 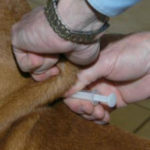 Dogs which test negative for heartworms are placed on preventative; those which test positive are treated. 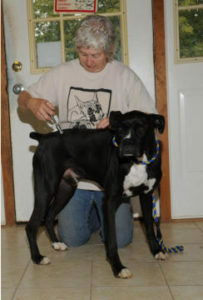 Boxer Rebound is exceptionally fortunate to have the volunteer services of Dr. Rae Powell, a Certified Animal Chiropractor. 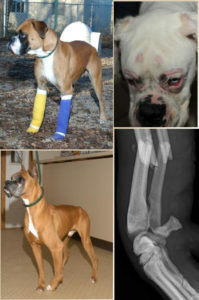 Dr. Rae visits regularly to assess structure and mobility and to maintain optimum joint status of all our Boxers. 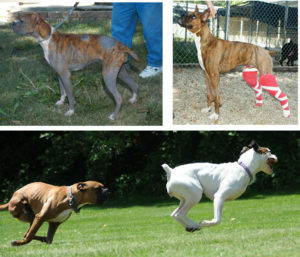 Boxer Rebound is committed to providing our Boxers with exemplary medical care, including extensive tests and procedures to address injuries, allergies, heartworm disease, dental issues, mange, etc. Our vets at Woodstock Veterinary Clinic are intimately familiar with Boxers and highly proficient at identifying and treating whatever issues may be present.